I have a feeling this kit I'm about to show you will get used again and again and again. 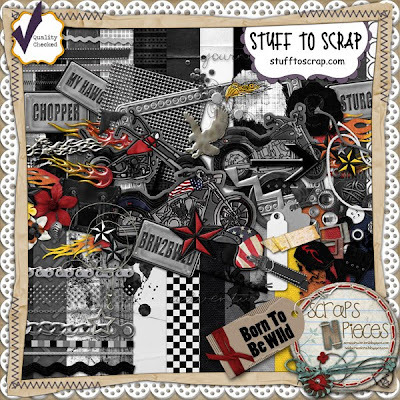 It's called Born to be Wild from Scraps N' Pieces. This kit was made with motorcyclists in mind, but is a great masculine kit also. You will love all of the Black, Grey & White elements. I didn't think I had any pictures to use for this kit, but after seeing what the other CTs did, I know now that it has many uses. I borrowed a few pics from my Aunt Eileen of my cousins' kids on 4th of July. They are all such cuties!! Go check out the kit now. It's on sale for $2.50 through Wednesday (7/27). Don't forget to stop by the SNP blog tomorrow for some freebies. 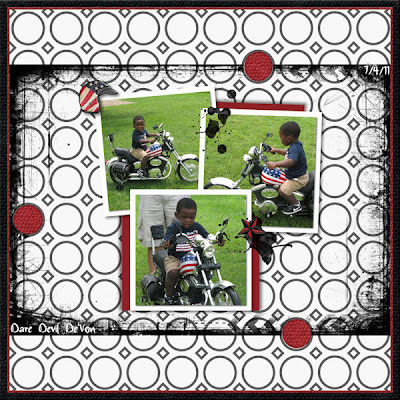 I created this 1st page below for the Twitter challenge. We had to use the word "awesome". **Don't forget - the Christmas in July sale at STS ends today.